When your pipes are leaking or your water bill has increased for no apparent reason, get in touch with a skilled and experienced residential plumber. Pete's Plumbing offers residential plumbing services Signal Hill, CA, including the Greater Long Beach and Lakewood areas. We're committed to providing superior service and building long-term relationships with our clients. Clogs and broken heaters do not wait for anyone. Get the service you need, when you need it. In addition to our regular business hours, we offer emergency service 24 hours a day, seven days a week. Just give us a call, and we'll have one of our experienced plumbers come to you as soon as possible. If there's a plumbing problem in your home, count on us to fix it quickly and properly. There's a long list of things that can go wrong in any home—leaking pipes, water heaters that don't work, clogged drains, low water pressure, and a number of other concerns. 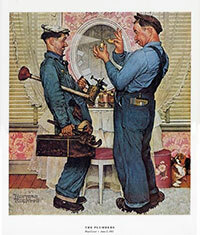 Our plumbers have seen just about everything and know how to fix it all. Our repair team is available around the clock, so you don’t have to spend your weekend running around the house emptying buckets under your pipes. Our plumbers will come to your location quickly to assess the problem. We'll be glad to give you a free estimate. The right repairs, completed at the proper time, can restore your property and protect your peace of mind. Also, it can also save more money than opting to replace a fixture or appliance. Let our plumbers handle the hard work so that you may breathe easier. Our plumbers stay up to date with the latest advances in the industry, and we are knowledgeable in a wide array of plumbing appliances and fixtures from the leading brands and manufacturers. As a result, we have the know-how and expertise to troubleshoot and resolve plumbing issues at the source. Are you expanding your home or adding plumbing fixtures to a room? Whether you're adding a new bathroom, remodeling an existing kitchen or bath, or just installing a new sink or disposal, we can take care of all of your plumbing needs. Don’t leave your plumbing installation to an amateur—we make sure your fixtures are properly installed so they run more efficiently for many years to come. As part of our residential plumbing services, we can revitalize the look, feel, and performance of your system. Whether your plans involve the kitchen, bathroom, or a new spa or bar, we will work with you to get the results you want--all according to your schedule. Old galvanized water lines deteriorate over time. There are also types of plastic piping that can require ongoing maintenance. Both can lower the real estate value of your home. Leaky pipes are notorious for damaging homes from the inside out, contributing to wood rot and the growth of mold and mildew. Don’t let compromised pipes damage the safety, efficiency, or value of your property. In these cases, repiping is often the best option. Our company handles whole-house repiping, and we have become experts at doing these projects with as little disturbance to your home as possible. You deserve to work with residential plumber and heating technicians who treat you--and your property--with respect. When you hire us, you can have confidence knowing your property is in good hands. Contact us to request an estimate for residential plumbing services. Our company is based in Signal Hill, CA, and we serve the Greater Long Beach Area.